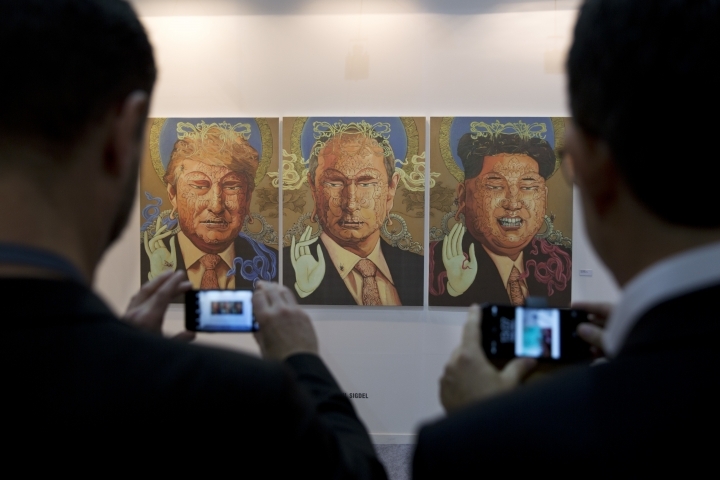 NEW DELHI — It's no surprise that satirical portraits of Donald Trump, Vladimir Putin and Kim Jong Un are the centerpiece of the India Art Fair, the annual feast of visual arts where politics took center stage this year, including groundbreaking projects on migration and rapidly changing urban landscapes in South Asia. Titled "Peace Owners," the work of Nepali artist Sunil Sigdel uses Buddhist motifs on the faces of the three global leaders. "Artists are responding to the global political climate," said Dina Bangdel, curator of Nepal Art Council in New Delhi. "We are also looking at agriculture and perhaps the disintegration of the rural community with urbanization. Artists are speaking in a Nepali voice but in the broader context of South Asia." Bangdel said the work of her artists reflects both the "fragility and resilience" of a country still recovering from the devastating 2015 earthquake. 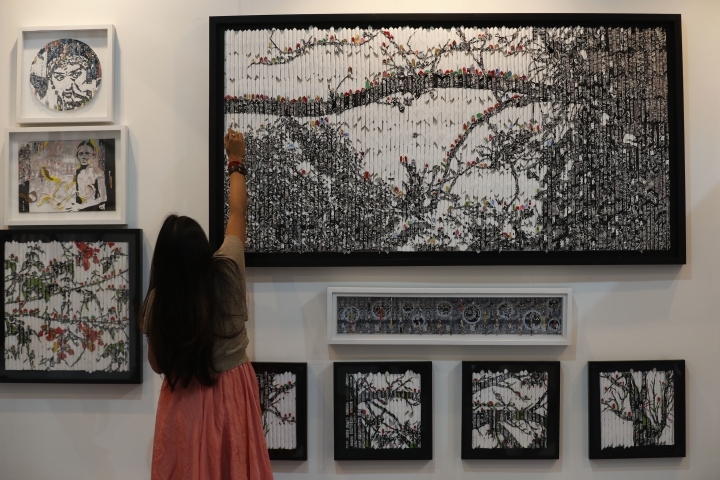 The art fair brought hundreds of Indian and international artists, exhibitors and collectors from more than 20 countries. Like the previous editions of the fair that began in 2008, South Asia remains the region in focus. A community-based public art project "No Man's Land," supported by Britto Arts Trust from Bangladesh and Shelter Promotion Council from India, explores the shared history, geography and culture of the two neighbors in the context of recurring border tensions and illegal migration. The cross-border collaborative project allowed Sayantan Maitra Boka , an art curator from India, to work with Bangladeshi artist Mahbubur Rahman. The two met in March 2014 in the physical space of "No Man's Land" as they shared their work and memories. Their installation comprises a montage of photographs and video from border villages on both sides. "The idea was to explore what a fence could do to you, how claustrophobic a fence could be. And to walk into Bangladesh or rather the 'No Man's Land' without a visa and passport. So it was a unique experience and it's an ongoing work which we are continuing," he said. 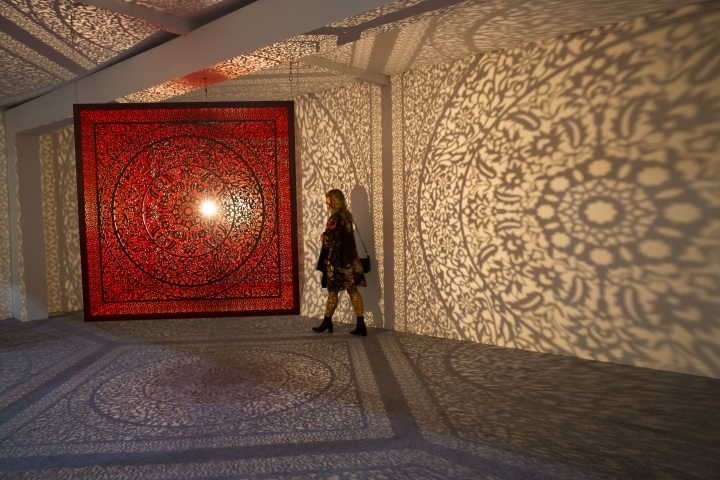 Political and social themes including access, migration and integration are also explored in cutting-edge installations in various art disciplines. Experimental art on display using various media works includes "The Swing" by Bangladeshi Tayeba Begum Lipi, made with stainless steel razor blades as a metaphor for rapid industrialization. 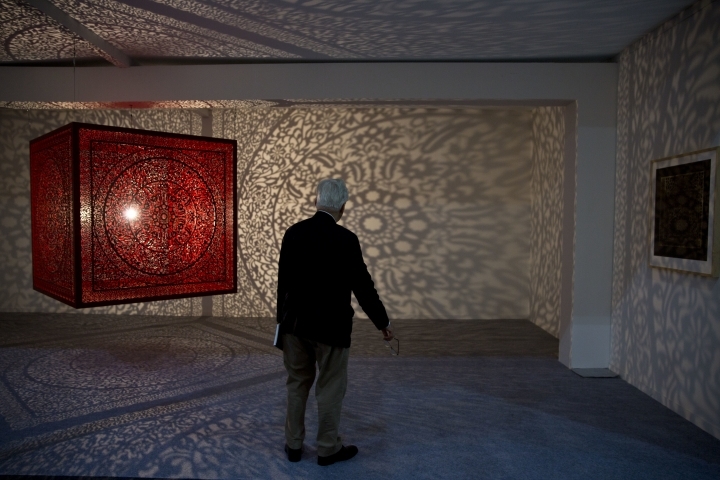 Sculptural installation "Shimmering Mirage" by Pakistani-American contemporary artist Anila Quayyum Agha has a single light bulb reflecting in a black square cube, laser-cut with delicate geometrical patterns used in a sacred Islamic space. "Woven Chronicle" by Indian artist Reena Saini Kallat represents her vision of wires as both conduits and barriers. Using electric wires, Kallat has created a woven map tracing the routes of contract workers, asylum seekers, refugees and other migrants across the planet. A statement from the artist says that the cartographic work highlights the "inherent contradiction in celebrating an increasingly connected world while stringent immigration laws, closed borders and prejudice face individuals seeking to transgress geographic boundaries." One of the most popular displays is a rare collection of archival photographs of India's independence leader Mohandas K. Gandhi rhat has been sourced from his grandnephew Kanu Gandhi. The painstakingly restored photos offer an intimate glimpse into Gandhi's life and interactions with politicians and ordinary people during the freedom movement. "It comes from an unschooled photographer, looking at his own granduncle, capturing private moments of a very, very public figure and that's what makes this work stand out," says Prashant Panjiar of the Photoink photography gallery. For auto art enthusiasts, there is a BMW with colorful faces painted by Italian artist Sandro Chia. He said in a statement that the painted automobile reflects the gaze of the people looking at it. 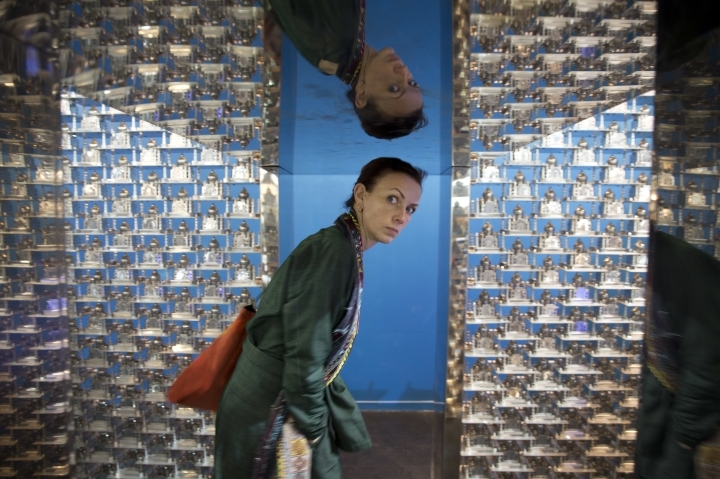 The cultural discourse at the fair is also looking at the role of digital technology in an evolving art world. Many post-internet artists are giving a virtual life to their physical art as digital technology makes art more accessible and brings global attention to artistic talent than was previously possible. Digitization allows presenting collections of regional artists that cannot be physically displayed in remote places due to logistical and financial reasons. Even works of modern Indian masters like F N Souza and S H Raza are listed for online sales. "The digital medium has opened up the global market and made it local," said Bangdel. "The digital world opens the borders — so in other words, we are really sort of traversing both geography as also time and space." Videos and sound art, animations and interactive art forms that only exist online can also provide an alternative experience to those with no access to galleries, said Sayantan Maitra Boka, a curator from India. "I just feel that maybe we don't have the proper technology right now to transmit the experience of art to the digital life," said Spanish gallery director Sabrina Amrani. "But we are building the bridges and we are crossing them — we just need maybe a new car for it."